Here I am with my first Utah bull. My guide prepares for field dressing and skinning. I wanted a 6x6, but this 5x5 looked plenty big enough when he came walking in. My goal was to take an elk that was bigger than a raghorn, and this animal certainly filled the bill. My extended trip to Utah in September and October 2008 was one of my most memorable ever. 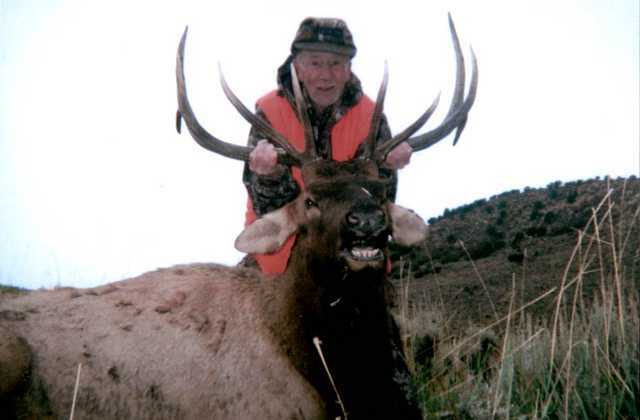 I'm retired, so after I bowhunted elk in Montana, I drove down to Utah well before my rifle elk hunt was scheduled. 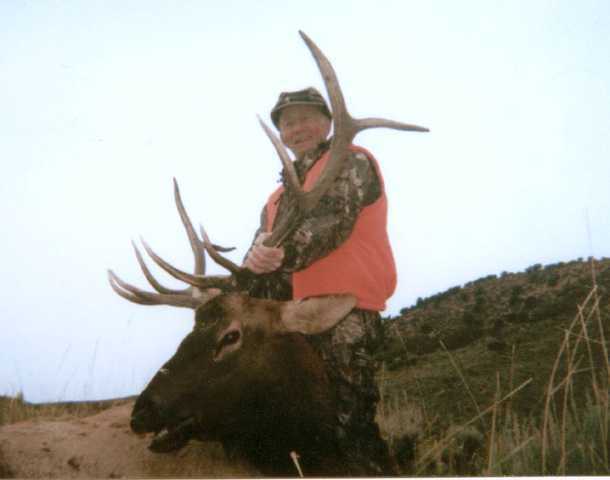 When I called former Hunts.Net President Rich LaRocco to tell him that I was heading to the Beehive State early, he invited me to tag along with him as he attempted to help his long-time hunting buddy, Chuck Johnson of Utah, who had a muzzleloader elk tag. So before I knew it we were driving in separate trucks to some of the most rugged elk territory I had ever seen. Before we even reached the area we were going to hunt, we saw a huge 6x6 bolt from a water hole along the road. 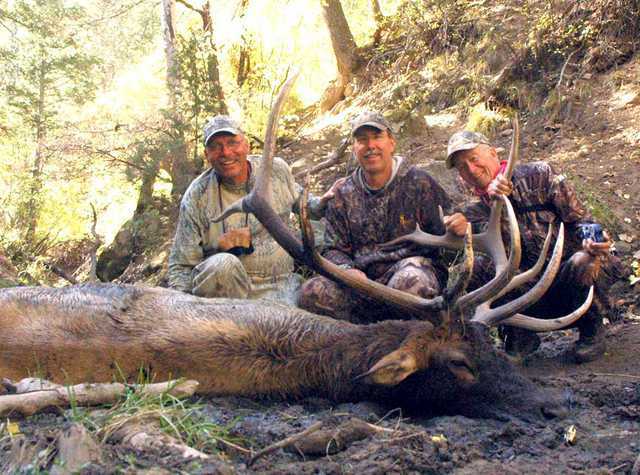 President Rich LaRocco, his friend Chuck Johnson and I are happy with the bull Chuck dropped with one shot. 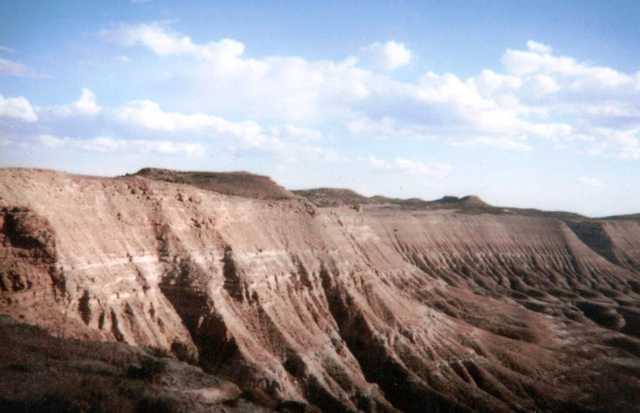 Some rugged territory near one of the elk hunting areas in Utah. We saw and heard many bulls over the next couple of days, and one day I spotted a large seven-point bull while Rich and Chuck were trying to close the distance on a bull in a nearby canyon. They decided to go after the bull I saw and set up on a water hole that Rich thought the elk in that area would use almost every day. I wanted to be there, but they wanted to minimize noise and scent, and so they sneaked into the water hole together and caught a good six-point standing in a wallow. Rich didn't think the bull was big enough for Chuck, so he never gave the signal to fire, and they watched that beautiful elk walk up the hill, bugling as he left. They set up about 50 yards from the water hole, and within an hour, the big seven-point came in. Chuck made a great shot and put he bull down immediately. They came to get me to show me the animal but tricked me, saying they had not seen the bull and wanted me to show them exactly where I had seen him. They had me up front and I practically walked on that bull before I noticed the magnificent trophy lying in the mud. It was by far the biggest elk I had ever seen dead. Now I could hardly wait for my own hunt. There was still a week or so to wait before the Utah hunt started, so I called the outfitter with whom I had booked through Rich and arranged to spend some time on one of his other ranches, helping out in camp. I had almost booked a hunt on this ranch, but Rich had told me I would have a better chance at a nice bull on another ranch farther west. There were some bulls on the first ranch, but they were scattered. A muzzleloader hunter got a nice 5x5 on the property, and then the outfitter had a guided combination mule deer/elk hunter, who took both animals in a couple of days. Finally it was my time to hunt, so I jumped back in the truck and drove to my hunting area and met my guide. Finally it was time for my own rifle elk hunt. On the morning of my long-awaited Utah elk hunt the camp manager had risen early to make us a big breakfast. I can't even remember eating because I was pretty excited. 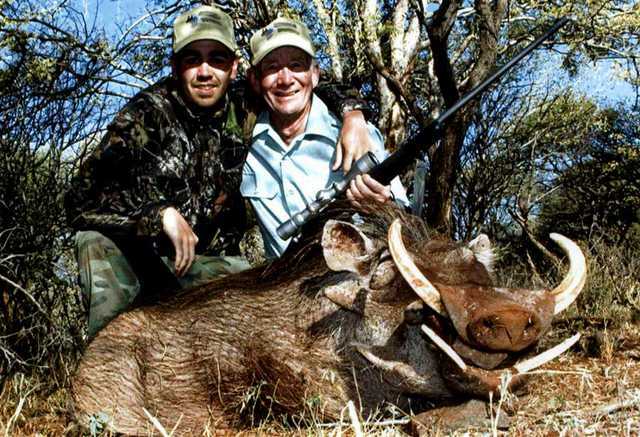 If a warthog can be a beauty, this boar I shot in South Africa certainly qualifies. I was happy to learn that Eric of Park City, Utah, would be my guide. I had met him last year when I went with Rich to Sonora, Mexico, to help on a trophy mule deer hunt. Eric was one of the hunters and got a beautiful, heavy-antlered buck, and I think he got a Coues deer, too. He loves hunting so much that he called home and told his wife that he would stay another couple of weeks to help guide other hunters. I had requested that Eric be my guide for the elk hunt because he is knowledgeable and skilled and is low-keyed and is personable. 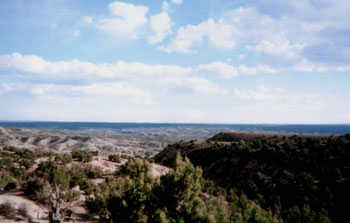 The guides drove us to the hunting area, where we unloaded an ATV and drove to the top of the mountain. The head guide had five bulls spotted from the past week, so he directed everyone where to start. Eric and I started downhill. We walked for half an hour to a clearing just below some quaking aspens and pines. About an hour went by before we saw a 5x5 bull feeding on top of the hill. He started to move toward us and went behind some brush. One of the other hunters made a good shot on him from across the valley. We were not in line of the elk so it was a safe shot. The elk was at least 300 yards from us. Some of the elk habitat in Utah doesn't look like the classic high mountain country with which I'm familiar in southwestern Colorado. We kept watching in front of us. Just after Eric started to head back to help the successful hunter take care of his animal, I saw a herd of cow elk come over a hill. I got Eric's attention, and then we concealed ourselves behind some brush and set up the shooting sticks. Sure enough, here comes a nice 5x5 that a little over 300 yards away. He was large enough that he appeared to ber a 6x6. "Take him when he stops," Eric said. The bull stopped broadside to me, and I took a breath, held it and squeezed the trigger. The elk did not move a muscle. "He's dead on his feet," Eric said, "but you had better shoot him again." I shot again and missed him clean. But the bull still didn't move at all. "Shoot him again!" Eric said. 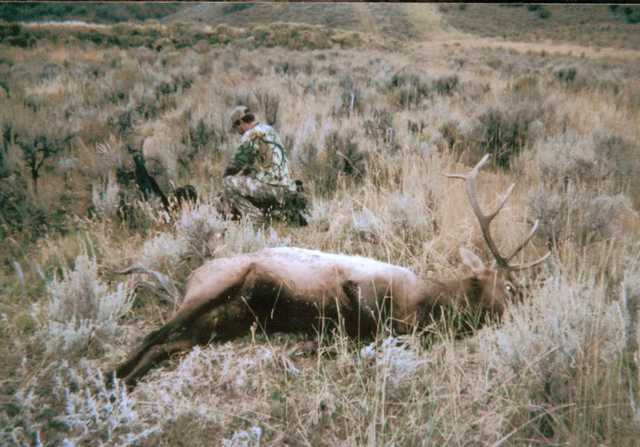 At the next shot the elk collapsed and lay still. What a morning. In only an hour of daylight I had seen two very nice bulls and got a beauty that I could take back to Michigan to show for my efforts. It had been a wonderful three weeks in the West. And one of the best parts of the trip is that I got to spend it with people who have become friends. I can hardly wait till next fall to go on my next big game hunting adventure. Great story, Bill, and some nice looking bulls there. Thanks for sharing! Did you know you can "tag" the outfitter in your story so that it shows up on the outfitter's Outfitter Page on Guidefitter.com? You can add that now if you like - just edit your story and add the outfitter.